So, you have spent enough time in growing your marijuana seeds, what is next? Of course, you should consider harvesting the marijuana seeds. Harvesting marijuana seeds is all about precise timing. You should not go for an earlier or late harvest. Instead, you need to do the harvest on time. Harvesting time is an important and exciting part of growing marijuana seeds. Harvesting period is the time when all your hard work and efforts pay off. 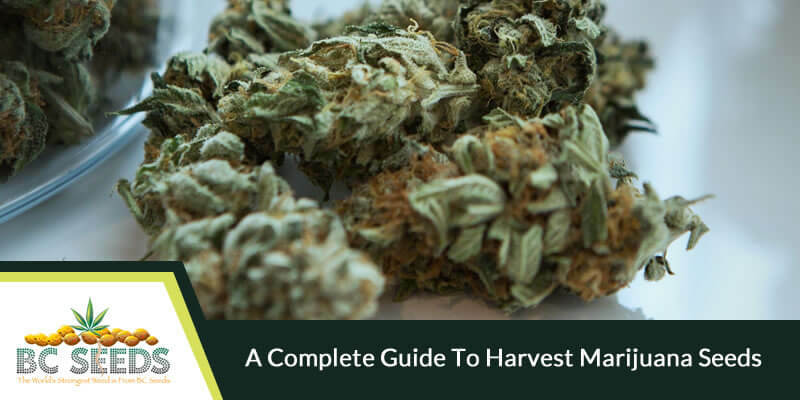 Before harvesting the seeds, you need to consider what to do with the harvested marijuana buds. If you find yourself puzzled with respect to when to harvest, you need to continue reading the article further. The following points will keep you informed about harvesting the seeds. It is obvious that you can get to know the harvesting time with some signs. Let us discuss the signs that indicate the harvesting time. You have to check the stigmas and pistils of the cannabis plant to determine whether or not it is the time to chop the seeds. If you find that half of the pistils are turned brown, then you can consider harvesting the seeds. You need to find out the color of the Trichome to determine whether or not it is the time to harvest the seeds. The Trichome will undergo three successive color states, which are clear, cloudy and amber. You need to harvest the seeds when half of the Trichomes are clear or cloudy and half of the Trichomes are amber. The unevenness of the color happens due to the uppermost cannabis buds maturing sooner than the buds at the bottom. No matter what, but you should not wait until all such Trichomes turn to amber. If you do, then the THC level will decrease and sleep-inducing cannabinoid CBN will increase. If you address yellow leaves in your cannabis plant, then you can get to know that your seeds are ready to harvest. The yellow leaves will fall by themselves. However, you need to remember that, falling of leaves will at times happen because of using fertilizers, so to be on the safer side, look for other signs to confirm the harvesting time. Of course, the harvesting time will be mentioned on the marijuana online seed source or package. You can find the number of days or weeks it will take to be matured by glancing on the seed package. At times, the mature time will vary according to heat, environment, and water. You can consider this breeder schedule, but do not take a decision by considering this point only. If you find that the leaves of your cannabis plant are dried or curled, then you can think about harvesting the seeds. The leaves will be dried or curled due to less intake of water when the plant is getting closer to its final phase. But pests and diseases will also cause dry and curling leaves, so you have to confirm this sign with other signs. What Happens in Late Harvest? Late harvest means that you let your plant to cross an extreme point of potency. Most people say that harvesting seeds late is such a bad method, as the THC will breakdown and the buds will turn more powerful when you allow it to mature. Also, the aroma and flavor of the seeds will go off if you keep it alive for a long time. Some medical users prefer to have more sleep-inducing effects and higher levels of CBN. These things will be achieved when you let the plant to mature for a long period. But, you should stay careful in late harvest, because, self-pollination will be started in some strains and those strains get converted into intersex. What Happens in Earlier Harvest? If you want to harvest many numbers of cannabis buds, then harvesting earlier is not a good choice. But still, there are some reasons that make sure that earlier harvesting is better. First is that, if you want to prevent your plant from getting affected by mold and bug, then you need to do the earlier harvest. At times, poor weather and less-than proper climate will bring some issues to your plant. In such cases, you cannot keep your plant inside to safeguard it from harsh conditions, so it is better to chop it earlier. If your plant is surrounded by offshoots, then harvesting earlier would be the better option. Stealth growing is another reason why people prefer to harvest it earlier. It is better to avoid harvesting earlier, but if you have no other options than premature chopping, then you can do it. If you do earlier harvest, the damage to potency will be less. The amount of time that you allow your seeds to mature will create a huge impact on your outcome. It is better to reckon the above-mentioned signs and methods to find the best harvest time.